This year’s CES slogan was “Feel the whoa.” Yet, after seeing the entire show, I have to ask myself: what “whoa?” Don’t get me wrong: CES 2018 was huge – the biggest ever with over 180,000 visitors from all around the world. But the general feeling was that consumer gadgets are simply losing their fuel. When it comes to TVs, phones, routers, drones, and the like, many devices have the same technology and features as the last two years with slight feature bumps. This does not equate to true innovation. Plus, in terms of TVs and smart home devices, I saw a lot of fanciful technology on display, but the vast majority of products there will not make it into the homes of consumers this year (or even in the next few years). That’s not to say CES was completely lacking in wow-factor, but it’s definitely taken a different course over the past several years. So, what was making a splash at CES this year? Read on for the top trends we noticed. Much like last year, CES 2018 was all about automotive. About 75% of the show was dominated by electric vehicles, huge infotainment displays, mobility services, and self-driving cars. 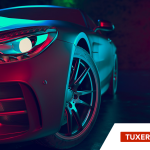 And while consumers may be interested in the actual cars on display, car makers and suppliers had a great chance to do some window-shopping for connected car software. Organizations like Automotive Grade Linux (AGL) and the GENIVI Alliance – both dedicated to improving and standardizing car software – had large presences at CES. Both had entire halls dedicated to their members, mostly software companies. For example, the annual GENIVI Networking Reception was set in an 883 m2 (9,500 sq. ft.) ballroom with an impressive attendance of over 1,300 industry professionals. 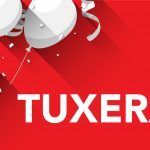 Plus, AGL had a hall featuring member products and services all week – including Tuxera’s – and their Showcase Reception had approximately 300 attendees. The second largest tech trend was in IoT technology. That’s been a phenomenon now for several years, but the big difference was the strong role artificial intelligence (AI) now plays in this space. At the forefront: an advertising company (Google) and an online store (Amazon). 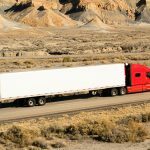 Manufacturers of IoT devices are scrambling to get products to market that interact with and are approved by these two giants. It would appear, “Works with the Google Assistant” is the new equivalent to “Intel Inside.” What all this signifies is a switch from specs-focused technology to a greater emphasis on usability and design. Many of this year’s devices had some basic AI or were even physically packaged in a robot form. For example, smart fridges (which are hard to sell frequently) are now “rolling fridges” with wheels and a face – and they even talk to you. I also saw kitchen robots that could walk me through recipes, along with robots which tell stories to children before putting them to sleep. Manufacturers are turning everyday appliances and tools into intelligent devices with faces to get closer to the consumer feelings. Despite all the buzz and fuzz, it’s true that CES keeps gathering the greatest tech in the world in one show. And mobility, together with self-driving cars, seems to be the hottest topic in tech today. CES definitely delivered in that sense. Once again, we were happy to be a part of all the buzz of CES 2018, but even happier this year to see that our strongest market, automotive, keeps growing and delivering innovation year after year. 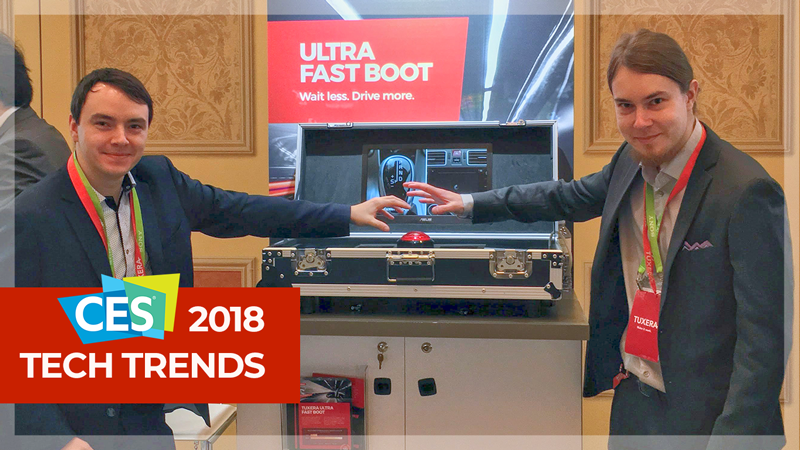 Our Ultra Fast Boot demo drew the largest amount of attention at both the AGL and GENIVI events, which is just another sign that cars and mobility have plenty of innovations to come in the next years. And we are proud to be part of that movement. Thanks to all who stopped by our booth to press the big red button and start the war between old IVI systems and the infotainment of the future! In case you missed it, check out our Ultra Fast Boot teaser!